Following on from our successful Open Day on 25 November, our attention is now turning to our two- day Spring exhibition on 25th and 26th of May 2019. For this May's exhibition we have five visiting OO layouts, all over 17' long. So watch out for Wiveliscombe, Folly Lane, Prior's End, Christchurch between the bridges and Langley. Currently N will be represented by Waton and we are planning more N and OO exhibits. There will also be trade stands, demonstrations and a good selection of refreshments. Watch out for further updates here. 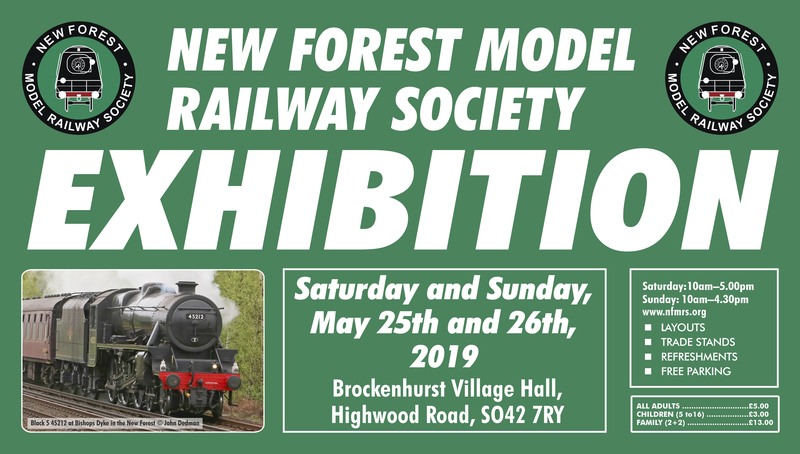 The exhibition is held in the Brockenhurst Village Hall which has a large, free car park (see our 'Contact' page for directions). If you are visiting us by rail, the Village Hall is only a five minute walk from Brockenhurst Station. Make your way to the station car park on the north east side of the station. Exit through the gate in the north east perimeter fence (look out for the orange handrailing at a ramp) and turn left into E Bank Road and proceed to the end of this no through road. Carry on in a south east direction along a straight footpath that leads to the village hall. We look forward to seeing you at our exhibition. And if you missed our November 2018 Open Day you can read a report here.